I’m normally a bit of a wimp when it comes to doing something daring, so when my mother proclaimed she wanted to go on a speed boat this year for her birthday, I would be lying if I said I didn’t feel too eager to step up to the request. 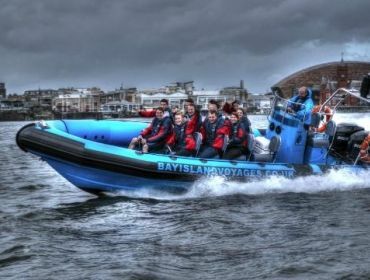 Recently, my family and I headed off to Cardiff Bay to do something we’d never experienced before – speed boating. 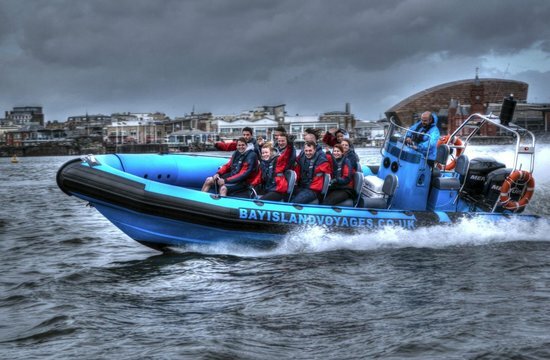 We decided we would only go for a ‘Bay Blast’, which is the shortest and cheapest trip that Bay Island Voyages offer, lasting for only 15 minutes and only costing £7 per head. There had to be at least six people on the boat (maximum of 12) so it was lucky when six members of my family turned up. Obviously, I was wrong. (Well, clearly, otherwise I wouldn’t have lived to tell this tale, would I?) As we hopped onto the speedboat (I swear I almost fell. What do you expect? Top of the range klutz at your service) and chose our seats, I wasn’t quite sure what to make of the seats. They weren’t benches in rows, as I was expecting. They were long and round and you sat on them as if you were riding a horse, with something to hold onto in front of you. I originally wanted to sit at the front – if you’re going to do it, do it properly – but when I realised I’d be on my own and close to the water, I chickened out and sat in the middle. After Ryan, the guy who was steering the boat, gave out safety instructions and my pathetic request of a One Direction song to be played (he had one and he played it. Win!) we headed off slowly and calmly out to the wider area where things took to full speed. With the slow melody by my favourite boy band fading out, Ryan played some more adrenaline-raising music to match the speed we were about to take off at. Pharrell’s ‘Happy’ began to play, which was a delight to my mother as it’s one of her favourite songs. Well, it was her birthday after all. 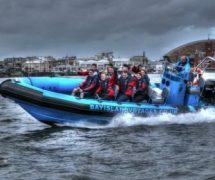 We began to speed (as you doâ€¦on a speed boat) and circulate the bay through the water, doing full circles which managed to cause waves to form which we rode over. We tilted, twisted, turned around the bay, with people sitting on the outside occasionally getting sprayed by the water (unless you were my step brother who got soaked at every nook and cranny we hit). It was pretty insane. Although the wind caused me to squint a lot, I didn’t really care – I was having a lot of fun with my family and it was a new experience I quickly grew fond of. Sadly, time flew by and before we knew it, we were heading back to the dock. After departing the boat, we all had a slight case of the sea legs as we safely got back to land. It was one of the most enjoyable 15 minute periods of time I’ve ever had and when I found out in the future I could plug my own phone in for music, I was proper chuffed and already started to plan my next trip with Bay Island Voyages. Maybe next time I will pay the £20 per person and go on the sea blast which lasts an hour, because I know it will be worth it. Creative Writing: An Ordinary Day At The Beach?